This exciting new style from our camo wedding rings line has a beautiful and wide pink camo pattern. The pink camo inlay is 4 mm wide and is an authentic Real Tree camo pattern. 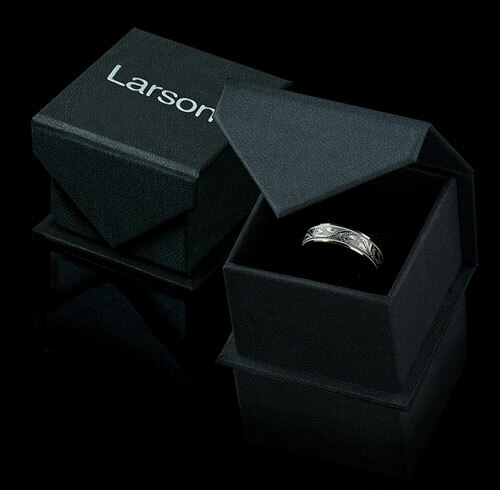 This comfort-fit titanium wedding band is 5 mm wide. This is the perfect wedding band to represent the love and commitment you have for one another. Note, pink camo inlay is made of aluminum and can be scratched. At the time of purchase, this ring is automatically registered with the most comprehensive lifetime warranty in the industry. Besides covering manufacturing defects of any kind for life, the warranty also covers accidental damage to the ring, and even theft or loss. In case of damage, simply return the ring and Lashbrook will replace it for you. Because alternative metal rings are extremely hard, they cannot be resized using traditional methods. This lifetime warranty also includes a lifetime resizing policy, which means if your ring size ever changes, Lashbrook will replace your ring with a different size. The fee to use the lifetime warranty and sizing is 20% of the price of the ring. For complete warranty details please see our Warranty information page.